There are plenty of scavenger hunt ideas for adults that can bring fun and adventure to any Halloween party. 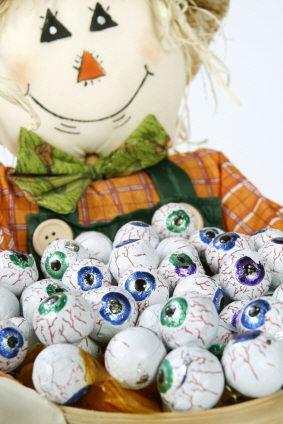 Add a fun and frightening scavenger hunt to your celebration to entertain and amuse your guests. For people who like to throw theme parties, Halloween offers plenty of ideas to choose amongst. If you like to throw costume parties, Halloween is obviously the perfect occasion. Once you have all your friends all dressed up, it's fun to give them someplace to go. A scavenger hunt will give them a chance to show off their costumes while having fun searching for treasures. If you need help downloading the lists, check out these helpful tips. For those with a theme, coordinate clues and items with the theme being used. Decorate the main area, dress the part and have your guests carry items related to the theme. For example, for the Western theme, dress as a cowboy and hand guests red bandanas and baskets to use to collect their items. Have guests search for items such as a cowboy hat, hay, boots, horse, and more. The best part about scavenger hunt parties for adults is that all the real work is done ahead of time. It is a lot of work intially, but once the scavenger hunt is set up the host can use the search time setting up food and other fun things for the guests to do when they return. The first thing the host has to work out is how far ranging the scavenger hunt will be. For apartment dwellers, the scavenger hunt will most certainly be outside the building or at the very least outside the apartment. For homeowners, the scavenger hunt can be limited to the house, the yard, or the entire neighborhood. Once you have decided the area of the scavenger hunt, the next step is to figure out how you want guests to collect the treasures. There are as many different ways to approach the list of items to be found, as there are many ways to hide them. Decide if you want guests to retrieve actual items or if you want them to photograph the items. If you prefer the latter, give guests disposable or digital cameras to use to capture the images. Each team can get a camera to use. Since a scavenger hunt is all about getting your guests to have fun, you will want to make it appropriate for all your guests. Don't make it so difficult that your guests will be searching for hours and getting frustrated finding their items. Make it simple and fun so that everyone is sure to enjoy searching for the items while enjoying the Halloween game.